I told Eddie to empty the trash. So he did - except the bits stuck in the <what? ?> at the bottom of the can. I guess "empty" means to empty most of, but not necessarily all of. And then Chris emptied the dishwasher. I didn't think about it until today, but an empty dishwasher still has an awful lot of racks and spinny things in it. So maybe empty could just mean a bunch less than what was there when it was full. And my home has been feeling empty, or at least emptier than it has been. I know having an "empty nest" officially means that all of your chicks have flown off. It's only my Alec who has spread his wings. But even having one gone makes a big difference. I feel it when I look at the bank of homework computers he set up. I feel it when he gets a letter in the mail and he's not there to hand it to. I feel it when I pass the closed door of his room. I feel it when I count the plates for dinner, thinking "we have less now than we used to" - as if feeding nine people is substantially less than ten. But my heart isn't more empty. There's no blank spot where Alec used to be, for he is still in there. If anything, my heart is more full now that it used to be. It's full of excitement for the new things he gets to be doing at college. It's full of happy with the man he is becoming. It's full of faith that the Lord will watch over my boy when I can't. 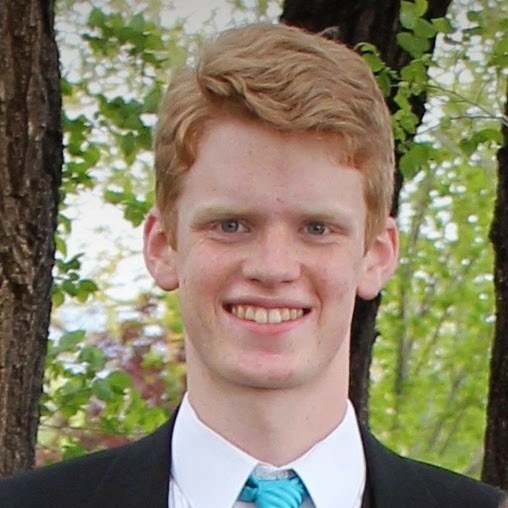 And there are a few Mother-worries tucked in there for good measure: about getting good roommates and how are we going to pay for all this and will he do well in his studies and hoping that he will make good choices. He called me this afternoon, worried that his score on an upcoming test (which is a huge pre-requisite to staying in the classes he has and progressing in his major) won't be good enough. I know that feeling well. I've had it many times through life - both in and out of school. That worry boils down to the scary "This is hard. I'm not sure I'm prepared. What if I fail?" Man, that's a hard one. I comfort and cheer as well as I can. I hope for his success, and know that either way, this can be a good learning experience for him. I wish I could wave my magic wand, but the growth is an vital part of independence and growing up. And his empty spot in my home is truly a full spot in my heart. "Being a mother is not easy. Let me say that again. Being a mother. Is. Not. Easy. But I get better at it as I go along. Some of the things which troubled me as a young mother have become easier. There are an awful lot of things I wish I'd known when I started. I can't count the number of times I've kicked myself and shouted, "Why did it take me five (or six, or seven, or even eight) babies to figure this out?" But I do wish I'd known then some of the things I know now. Here is another post in a What I Wish I'd Known (or WIWIK) series. I graduated from college when I was 6 or 7 months pregnant. My husband was still in school, though, so it was to a humble college apartment where we brought our first baby. We were very stingy with our meager finances, and decided to cut costs by using cloth diapers instead of disposables. My mom did cloth diapers, and I helped with the diapering and laundry of my youngest brothers, and it really didn't seem that hard. Good enough for my mom - good enough for me. I remember loading our laundry basket, the diaper pail, and our new baby into the back seat of our old '67 Mercury Cougar, and driving to the laundromat. Good times. This post should more correctly be categorized as "What I'm Glad I Did Figure Out," than "What I Wish I'd Known," but whatever. I'm glad I started out with cloth diapers. I've saved tons of money with eight babies, and it really isn't that challenging. I didn't use the pretty all-in-one cloth diaper systems, nor did I splurge on the fashionable diaper covers (which weren't around when I started diapering). I still would have saved money, but for me, the ultimate penny-pincher, I went all-out-el-cheapo. $404 TOTAL for 2/12 years of cloth diapering for TWINS! Of course, we do use disposable diapers for church or extended outings, and we have used them at night when the output was more than a single cloth diaper could handle. We would need to increase the amount accordingly for disposable diapers, or increase the washing requirements for double-diapering at night, like I did with my other boys. But compare this $404, if you will, to what it would have cost us to use disposable diapers exclusively! According to Consumer Reports, covering a baby tushie with disposable diapers can cost about $2500. Times that by two please, to show us that we would be in the poorhouse if we had to buy $5,000 worth of disposable diapers for our twins. And just think of the savings for Mother Earth, too. My boy left. I feel a sense of empty, as if I have lost him, but a wise friend told me that I have "launched him, not lost him." I like that much better. Alec has been anxious to leave for quite some time now. I can't say that I blame him. I distinctly remember feeling the same way. I couldn't wait to get out of the house - be free from all the childish restrictions. My mom and I had a hard time getting along. She worked while I was in junior high and high school, so I was in charge of my younger brothers until she got home. But I don't think I wanted to relinquish my authority when Mom came in from work. My dad called us "two queen bees in one hive." I picked furthest-away college I dared go to (not even 300 miles! ), trying to get as far from home as possible. I regret the trouble I gave her, and I totally get it now. And I think the memory of those troubles can help to make me a better mother now. When Alec has, in frustration, let loose that he just wants to get on with his life, I agree with him. Yes, my dear son, you should fly on your own wings. Let's make sure you have all your flight feathers in working order. Together, we identified skills that he needed to have, and areas where he needed to assume more responsibility. It was not easy. The path was very dicey, and we often did not agree. But, like I'm sure my mother did for me, I loved him. And I told him so. Even when he didn't want to hear it. And all too soon, it was his last night here. He packed up his backpack, a small suitcase, and a little bag, and told me that he was ready to go. He's in temporary housing (he lives in a hotel room!) while he waits for a dorm room to open up, so he doesn't need much "stuff." I drove him to the university, stood by while he got himself registered, followed him to his room, and nodded at his roommate. Then I gave him a big hug and drove home. To me, it was his last night. To him, it was nearly his first day. What an exciting beginning of a new adventure! I'm happy for him, and lots of other emotions. I think he'll do great things. Now... how do we get him to come back and clean out his bedroom? It's been interesting to watch how different family members have been dealing with the death of my mother. For some, it's very obvious and difficult. Some only mourn when they are alone. Some swing in and out of sadness. I find my own reactions interesting: it is as if grief has been pulled from a variety of sources, and the whole wad has been slung my way. My grandmother (Mom's mother) died when I was about 5. I don't remember much about her, but I have a very clear memory of how sad and dreary it was on the day of her funeral. My dad's parents passed away when I was in my teens. I miss them dearly, especially my Oma. Mom's dad lived well into his 90's, and his beautiful passing is a most sacred experience of mine. All the feelings of loss from my grandparents' deaths have come back to me these past few weeks. Another grief that has resurfaced is the death of my first husband. After fighting brain cancer for seven years, he passed away just after our 13th anniversary. He was my sweetheart, my confidante, the husband of my youth, the father to my first five boys, my rock. I was a widow at age 33. Too young. I felt so alone, so abandoned. I'm feeling that way again sometimes. Alone. Left behind. Most of the time, I feel fine - happy, even. I am so comforted by my faith in God's plan. I'll see Mom again. I will. But sometimes the sadness wells up and crashes into me and all I can do is deal with the wave of grief. I guess I'm glad that I have been familiar with death. My mother's final arrangements were much easier than my husband's, for example. That was partly due to her good planning, and partly because of my own experience. Been there, done that. And this likely won't be the last time. I'm glad that I know where we go from here, and that we'll be reunited as families. Death is just another step through God's plan, and I'm glad it's not a horribly frightening one for me. It's just that much closer back to Him. In her office, my brother found Mom's journal. We found lots of journals. One, a nice, hard-bound volume, was a gratitude journal. On the first page, Mom wrote about how she was going to write in this book every day. She detailed how she would write about little or big blessings. She might write a lot, or just a little. Her next entry listed her biggest blessings: her sweetheart, her children, and grandchildren. She wrote down every one by name. Later, she wrote down things that made her happy. Sitting by a stream in the canyon, reading books, a gently breeze, children laughing, popcorn. The next page is blank, as is the rest of the book. I love reading about the things Mom loved. I wish she had written more. How many times do we start a good project and never finish it? We have a good beginning, but not the follow-through. But I'm grateful that I can start over when I get sidetracked. It's called repentance. So grateful I can repent. I ought to write that down. Mom was so organized. We found sticky notes all over, identifying different papers, earmarking a cookbook for her brother's family, identifying a paper that needed to be returned. We found one that said, "Is the gospel true? YES!! Do I love you? YES!!" We found an envelope, addressed to the family, containing one love note for each of us - written on sticky notes. 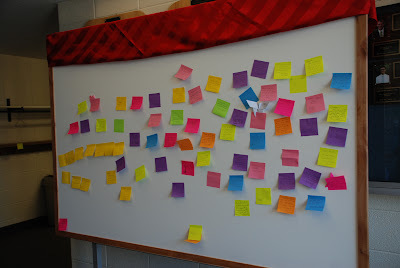 At the funeral, we made a big board for her, and asked everyone to write a sticky note - a memory, a thought, an appreciation. The board got covered. Lots of folks loved my mom - because she loved lots of folks. Love kind of goes around that way. My mom as ultra-organized. After she died, we opened up her "black book" to read what she had written about her end-of-life wishes. 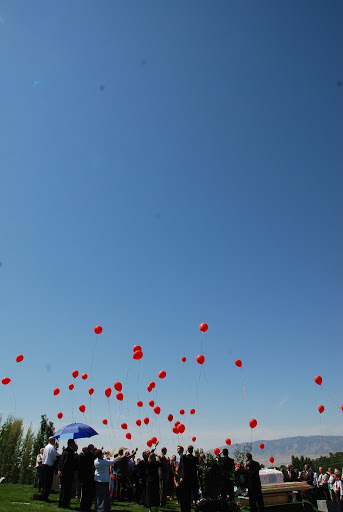 She wrote that she wanted "twirly-gigs and balloons" at the cemetery after the funeral. We looked and looked and looked for pinwheels, but evidently they are a beginning-of-summer thing rather than an end-of-summer one. My sister-in-law's friend finally made up a bunch of terribly cute pinwheels to pass out to the kids. Twirly-gigs, check. Balloons were much easier. Mom loved bold, deep colors. One wall in her bedroom was an intense red. 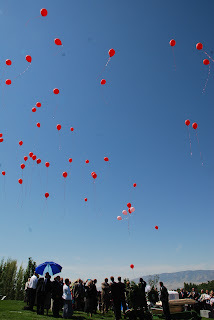 Red balloons were a no-brainer. 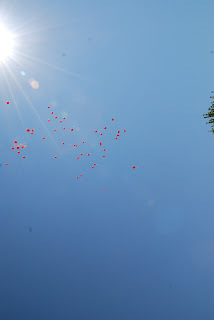 One balloon was mylar, with red roses and "I love you" on it. That one, and the bunch of red and pink balloons was for my dad. He was going to release them with all the others, but at the last minute, he wanted to keep that mylar balloon. Thank goodness for brothers with pocket knives to pull it out of the bunch! Dad counted off, just like Mom always did when we were helping her stand up, "One, two, three!" 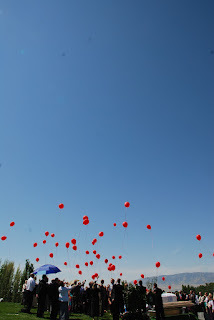 And all the balloons took off. Balloons, check. It was a lovely ending. 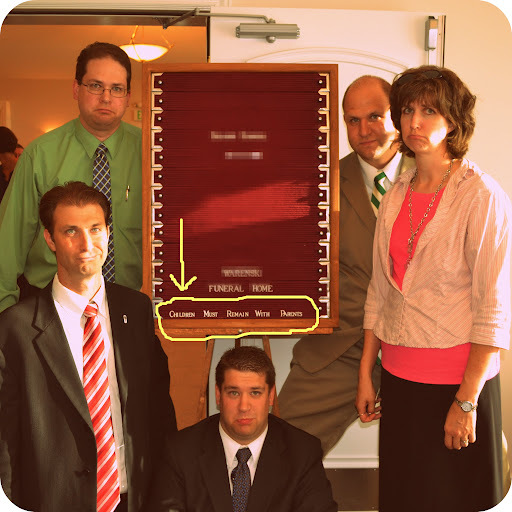 Yup, that's what the sign at the funeral home said. "CHILDREN MUST REMAIN WITH PARENTS." Like that, in all capital letters like it was important. We were tempted to reverse the lettering so it said, "Parents must remain with children." Because we thought Mom should have stayed with us. And there are all my handsome brothers, trying to put on sad, pouty faces (and squatting so their tallness wouldn't poke out the top of the picture). It was hard to look sad, because we make each other laugh. Right now, laughing is a good thing. “Oh. Resurrected is good. I want to be resurrected right now.” I tried to explain that before you could be resurrected, you had to die first. “Then I want to die right now!” I realized that strange things have to be looked at in a bigger context before they make sense. The inequities and unfairnesses of this life make no sense at all until we look at them in a much bigger overview. Things here are sometimes very hard. To get through, I use my GPS - the Great Plan of Salvation. Before I can get anywhere, I have to first acknowledge the terrain. There are mountains, plateaus, rivers, and buildings which I didn’t put there. They were there before me. This is the framework set up by God: First, we lived with God . There, we had the presentation and acceptance of His plan, the creation of the Earth, the fall, and our own births here. During earth life is also where Christ atoned for our sins, making it possible for us to return to live with God. We die, go to paradise or spirit prison as a temporary reward. In the end comes resurrection, or our bodies and spirits reuniting, and the final judgement, where we are ultimately responsible for our own actions, and if we’ve been good, our reward: living with God again. Next, I need to chart my course. I have to decide which way I am going to go - on the freeway, the scenic route, through the city, making detours... I can choose to accept God’s plan or not. I get to pick whether I want to do the good things God outlined as the best way to stay on course: accept Christ, be baptized, receive ordinances, share love - or not. Moral agency, the ability to choose and act for ourselves, is essential in Heavenly Father's plan. A testimony of the Great Plan of Salvation can give us hope and purpose as we wrestle with the challenges of life. We can find reassurance in the knowledge that we are children of God and that we lived in His presence before being born on the earth. We can find meaning in our present life, knowing that our actions during mortality influence our eternal destiny. With this knowledge, we can base important decisions on eternal truths rather than on the changing circumstances of life. Going over this GPS is more than just an intellectual exercise. Elder Henry B. Eyring said that it is “not just to know who God the Father is and who Jesus Christ is and who the Holy Ghost is. It’s to feel that is reality and that those individuals—the Father, the Son, and the Holy Ghost—are real, that they know [us], and they love [us] and they are attentive to [us]” And it’s an chance to use faith in choosing what seems to be the best course even though I can’t verify every traffic stop. It is also an exercise in courage, to get started and keep going. When she wanted to progress in her job at the school district, she made a plan to go back to college and get her degree in computer science of something smart like that. Then she mustered the strength to work her plan. I remember her sitting down with her homework at the kitchen table, begging my brother to help her with her math. She made a binder for us as we planned my wedding, noting all the important things that needed to get done, and planning when to tackle each part. She taught me to plan out the steps, so that you would only have to worry when it was necessary. She made countless lists on yellow lined pads, wrote innumerable sticky notes of things that needed attention, and calendared just about everything - except this funeral. She planned on having this family stay together forever, and worked toward that goal. She made frequent phone calls to each family, to keep in touch and see how we were doing. She sent cards in the mail and fun email cards. She gave gifts and took the grandkids out to dinner on their birthdays. She wrote down that we should be kind to each other, just in case we forgot. And she had a firm testimony that the Lord can help as we drive through life. One time we were on a family vacation, driving through gorgeous canyons. She was driving along a road, precariously winding along the side of a steep cliff. Suddenly, she pulled over. She didn’t know why, but had been prompted to stop. As Dad investigated, he realized that this was the last turnout for a while, and that the steering wheel had somehow worked its way loose. If Mom had steered around one more sharp turn, the steering wheel would have come off in her hand, leaving the vehicle without direction. It was sobering to realize that we easily could have been killed. I am so grateful for Heavenly Father’s Great Plan of Salvation. I am grateful for my dear mother teaching it to us, and showing us the way. I am grateful for God for engineering the path, and that Christ made it possible. As I chart my own course, I remember her loving example, and hope that I can pass it along to my children. Thanks, Mom. My mother passed away a few days ago. I miss her terribly, but I am filled with peace. It's as if God took my broken-open heart and poured a double measure of love and comfort straight in. I have to speak at her funeral tomorrow. I have no idea what to say. There are sweet things that would be nice, but totally insufficient. And the things that are vitally important are so close to my heart that there is no way I could say them out loud, let alone in front of a crowd. Many people loved my mother. She touched countless lives with her kind, thoughtful nature. She was so much to so many... but she is my mom. My mom!